Enjoy uniquely prepared herbal remedies for holistic health and your personal self-care. I make all the herbal oil infusions myself. I begin by steeping the dry medicinal plants in Organic Non-GMO Canola Oil. To learn more about herbal infusions and the oil I use, check out my blog post on Benefits of Calendula Oil. I infuse herbal oils from the medicinal plants and flowers of: Calendula, Arnica, Chamomile, St. John's Wort, Comfrey, Echinacea, Rose, Lavender, Rose Hips, Plantain and Jackass Bitters (to learn more about Jackass Bitters, here's its own post). Each oil has a special role in the various blends such as salve and lip balm. Then, I strain the herbal infused oils and mix them with base ingredients of African Shea Butter, Organic Aloe Butter, and local Beeswax. 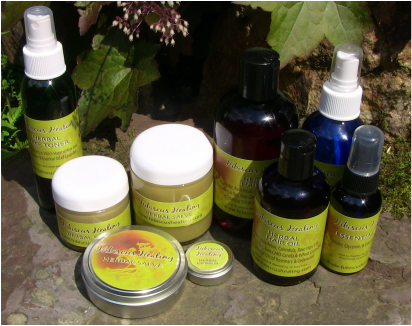 This is how I make my line of Herbal Body Care Products! These products are so healing for men, please, don't feel like they are "women's beauty" products. These are essential herbal remedies for your medicine chest. Click on the Title to purchase or learn more. It heals and protects wounds that need plenty of lubrication so a bandage won't stick to it, and hence not get infected. It's also great for cuts that don't require a bandage. It's extremely effective in healing burns. Keep the burn coated in salve until it heals. It is also helpful for healing bruises because of the arnica and comfrey oils. You can even use this salve on extra-dry skin or irritated skin with rashes or eczema. The ingredients in this salve can also help ease the pain of hemorrhoids and nurture the healing process. If you are curious about how to make salve check it out in my blog post. Freshen and clear a physical, mental, emotional, or spiritual space. It can be used in a room, in a bodywork session, or even on your personal body. Great for travel; spray it on a plane! This isn't like other girly face toners with artificial fragrances. It's true purpose is to hydrate and cleanse your pores. I put it in a mister so you don't have to deal with cotton balls either (yes, a mister, not a misses). Simply spray on your face and neck after your shower before you moisturize. This unique blend will combat microbial viruses that land on your face. Use anytime you need a fresh feeling or have been in contact with germs. For thick hair: apply after shower for more control over frizz or as needed. For thin hair: use once a week before shower. Leave in for 30 minutes. Then wash hair as normal. This is not lip gloss, don't worry. It's medicinal, like in the name. Sometimes your lips need a little nurturing. Like most lip balms apply as needed. This one is especially great at night for full lip therapy while you sleep. Add a small amount in the day to protect your lips from sun and wind because Shea butter is a natural sun screen.